Recipient of the Customer Delight Award at Asia Pacific level and winner of Demand Generation Award at Global level, Reena quit her Corporate job after 12 year of service to pursue her knack for Arts. A post graduate in ‘Appreciation of Indian Art’ from Nagpur University, India. She did her ‘Fine Arts’ from Birla Art Academy, Kolkata, India, and her Bachelor’s Degree is from Delhi University, India. 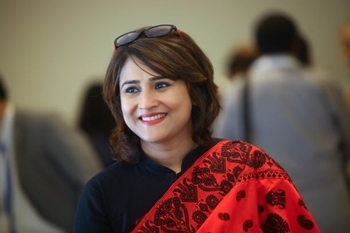 Reena is a fellow of ‘ArtThinkSouthAsia’ 2017-18, President of International Council of Museums, India (ICOM India) and Vice President at Kolkata Centre for Creativity. She did trainings at Tate Modern, Whitworth Art Gallery, Manchester Museum, U.K. and ICOM ITC Beijing. She has presented papers on travel grants in Egypt and Iran. She has been nominated for ‘Aparajita’ award as Woman Achiever by Sanmarg Newspaper and featured among twenty-five most prominent women in West Bengal, India. Reena is a practicing Sculptor and Painter. As an Artist she has been performing live art alongside Performers like Soprano Susan William, Jennifer Heemstra, Wendy Case, Kisrsten Docter, Amir Eldan, Deborah Moriarty, Dean Jim Forger and many more.